At an elevation of more than 1,500 feet above sea level, mountain top views await visitors at the crest of Sunrise Mountain. View a spectacular panorama of rich farmland and forest, soft hills and lush valleys in three states. Open fields, saltwater and freshwater marshes, a white cedar swamp, Pine Barrens and a northeastern hardwood forest provides an explosion of color and impressive sights. The park not only has pine forests typical to the area but also a swamp hardwood forest. Look for the beauty of the dogwood, laurel, holly and magnolia trees as they change in color. Cool crisp autumn days usher in the breathtaking colors of New Jersey's fall foliage. From September through November, New Jersey's state parks and forests provide endless opportunities to experience the brilliant transformation of the leaves. 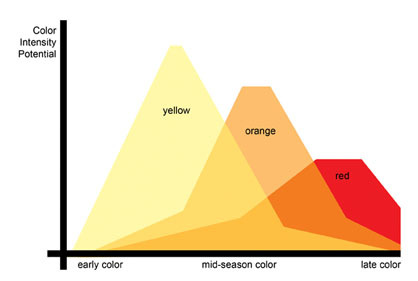 This graph shows the three waves of fall color - yellow, orange, and red. Depending on the region, each wave takes seven to 16 days to progress. In mid-season, where the three colors intersect, the fall display ismost colorful. Autumn changes begin in the mountainous regions and progress southward toward lower regions. With expansive deciduous forests, Eastern North America has one of the best fall color displays in the world. During the growing months, leaves produce chlorophyll, a green-colored pigment. Through chlorophyll the tree uses the sunlight’s energy to combine carbon dioxide and water to make glucose, which serves as food for the tree. This process is called photosynthesis. As summer ends, shorter days and colder air alerts the tree that winter is coming. The tree severs the leaves’ connection to water and minerals from the roots. 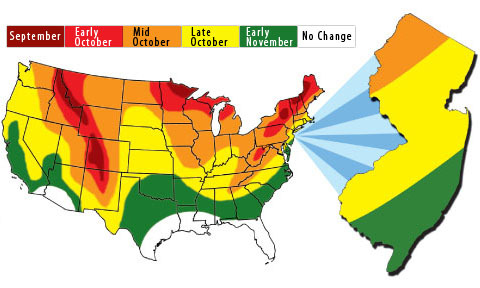 The leaves begin to die and chlorophyll production ends. The sunlight breaks down chlorophyll which reveals carotenoid pigments previously masked by the deep green. The remaining chlorophyll produces lots of sugar, which is not used up by the tree. Red pigments called anthocyanins are created through excess sugar and more sunlight. Sunny days and cool nights provide the best weather for good anthocyanin production. You may notice that the leaves may be more red where the tree receives direct sunlight. Shaded leaves don’t produce as many anthocyanins and appear less brilliant.